English has become a prominent Language of communication in India. In state of Maharashtra, too, it has been actively penetrating areas. even though Marathi Speaking will never go away, Maharashtrian people are paying the much needed attention in developing their English Speaking ability. Here, well see what are the basic things you need to speak in English confident. The very first thing is obviously knowledge of Spoken English. This includes some essentialSpoken English Grammar. Because grammar helps in structuring the sentences together. Many Marathi Speaking people have wrong impression that their grammar should be perfect and only then they should speak in English. Because of this misconception most of them never try to use English for their verbal communication. This situation is really sad. All these people have very good reading & writing skills. If you ask them to read or write anything on any topic, you will be surprised with the results. Thats how good they are! But ask them to reply to a simple question in English and again youll be surprised. They wont be able to answer. Their happens because of their over emphasis on being perfect in grammar. Dont get me wrong. Grammar is very essential. It is base of any language in cluding English. So everyone who wants to speak in English must know & understand it. The problem starts occurring when the person under importance to error less grammar. It grows to such a level that he becomes paralyzed because of it. Instead of getting help from his existing knowledge of grammar, he focuses on those parts which he is not getting right. So the ultimate result is he avoids Speaking in English. There is a solution this nagging problem. It has worked for me and thousands of others, who wanted to Speak English confidently. Most probably it should work for you, too. But you must implement & take action on the things that I am going to share with you here, today. 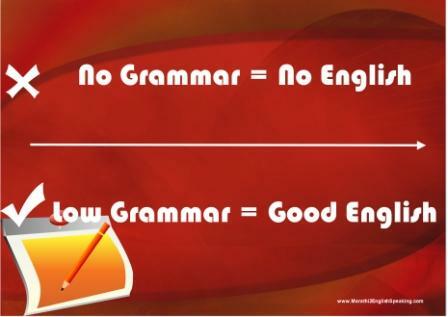 If you dont know any part ofSpoken English grammar, then first thing you need to do is learn it. Take any elementary grammar book & study it. Within a month, you will have good grasp of the main & broad parts of English grammar. Practice the various exercises given in that book. I hope you can get such book easily almost anywhere. Once you get quite proficient in basic concepts, then focus on using that knowledge in understanding structure of sentences. After all, when we Speak it is collection of small or long sentences. The more you focus on improving your sentence structure, the faster youll reach to your goal of Speaking confidently in English.